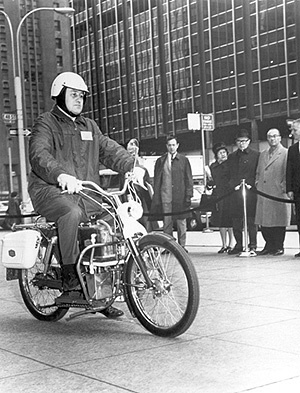 his alkali fuel cell motorcycle in 1967. "It looks like an ordinary motorbike but there's no internal combustion engine and there's no noise. The machine, which is powered by a hydrazine-air fuel cell system, was built under the direction of Union Carbide's Dr. Karl Kordesch (pictured), a pioneer in fuel cell development. Dr. Kordesch has run up over 300 miles on the motorbike which can do 25 miles an hour and can travel 200 miles on a gallon of hydrazine." If you have information about this fuel cell image, or alkali fuel cell technology in general, please fill out the Collecting History questionnaire accessible through the link at the top of the previous page.